Want to enjoy high quality HD Movies on your new Galaxy Note 3 phone? This article shows you how to rip Blu-ray/DVD ISO image files to Galaxy Note 3 playable video format for watching on the go. What’s the hottest Android smart phone in 2013? Samsung Galaxy Note 3 should be no doubt to be listed among the Top 5 which carrying a sharp 1080*1920 HD display. Blu-ray, DVD and kinds of video files boost your multimedia life, if you have a large Blu-ray/DVD ISO files collection, it should be such a cool thing to enjoy them on Galaxy Note 3 anytime and anywhere. But how to make it happen? What should we do to transfer BD/DVD ISO image files to Galaxy Note 3 for playback? This professional Mac Blu-ray/DVD ISO to Galaxy Note 3 Converter (only $34.3) is just designed to help you convert Blu-ray/DVD ISO image files to Galaxy Note 3 MP4 for playback and you don’t even need to run virtual drive to mount the ISO file, just simply import. With its clean interface, fast converting speed and good video quality, converting BD/DVD ISO to Galaxy Note 3 will be simply finished within a few clicks. FYI: If you want to keep all the audio tracks (language) and soft subtitles, here’s another choice for you: Blu-ray/DVD ISO Converter Pro. Step 1. Run this Top Blu-ray Ripperfor Mac, as the Blu-ray DVD ISO to Galaxy Note 3 Converter. Click “Load file” to choose Load IFO/ISO file. It will recognize the ISO image file automatically so that you will not have to run virtual drive to mount the ISO any more. Step 2. Select Samsung Galaxy Note 3 compatible format. Click the drop-down list and choose “Samsung -> Samsung Galaxy Note(*.mp4)” as the best profile for Galaxy Note 3. Click “Settings” to free choose output video size, bitrate, frame rate and other specs. Remember the file size and video quality is based more on bitrate than resolution which means bitrate higher results in big file size, and lower visible quality loss. According to my experience, for watching Blu-ray/DVD (ISO/IFO) movies on Galaxy Note 3, 720p with 1500~2500kbps is just all right. Step 3. Start the BD/DVD ISO conversion. When everything is OK, just press the "Convert" button to start the Blu-ray/DVD ISO to Galaxy Note 3 MP4 conversion. It will not take much time. Just wait for the conversion process to get done. How to transfer video from Mac to Galaxy Note 3 via Kies? If you are looking for a powerful all-in-one ultimate video converter software to convert various 1080p/720p videos, Blu-ray and DVD movies to your tablet or phone for enjoying, simultaneously saving time and effort, the Top Blu-ray Video Converter Ultimate program will be a nice choice for you. 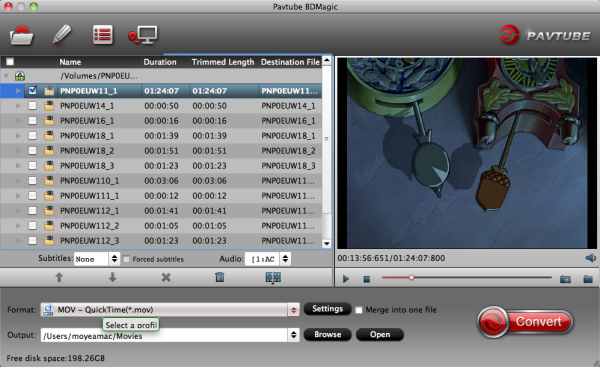 If you are running a Mac OS X computer, iMedia Converter Mac is the alternative. Samsung Devices: Galaxy Note 3, Galaxy Note 2, Galaxy Tab 3 10.1/8.0, Galaxy Tab 2 10.1/7.0, Galaxy S4/S3, etc. Apple Devices: iPhone 5S, iPhone 5C, iPhone 5, iPhone 4S, iPhone 4, iPad 4, iPad 3, iPad Mini, iPod 5, etc. Google Devices: Nexus 7 2nd Gen, Nexus 10, Nexus 7, Nexus 4, Nexus, etc. Asus Devices: Fonepad 7, Transformer Book T100, MeMO Pad Smart 10, MeMO Pad HD 7, MeMO Pad ME172V, Transformer Pad Infinity TF700(T), PadFone 2, Transformer Prime, Transformer Pad TF300, etc. Sony Devices: Xperia Z1, Xperia Z Ultra, Xperia Tablet Z, Xperia ZR, Xperia S, Xperia SP, Tablet S, etc. Acer Devices: Iconia A3, Iconia W3, Iconia Tab A1, Iconia Tab B1, Iconia W700, Iconia W510, Iconia Tab A700, Iconia Tab A210, Iconia Tab A200, etc. Motorola Devices: Droid Mini, Moto X, Droid Ultra, Droid MAXX, DROID RAZR MAXX, Xoom 2, Xoom, etc. And BlackBerry, HTC, LG, Toshiba, Lenovo, HP, Nokia, Vizio, Archos, Coby, Nabi, Nook, Kobo, etc.